Events for Shining Scars — Shining S.C.A.R.S. Stay tuned for details for the October 2016 tour stop in Raleigh NC. It is the mission of The Rise Above Tour to educate, inspire, and empower our youth to actively rise up against an epidemic that has spiraled out of control: BULLYING. Come and see Krystian and pick up your copy of Shining Scars at the West Virginia Book Festival. She will be signing books with Headline Books, on Saturday October 24, 2015. Follow her on FB and Twitter for more details. As a guest keynote speaker I am truly honored for the opportunity to congratulate the Johnson Elementary Graduating Class! Come and meet me at the BEST place to buy all your books for Christmas! Barnes & Noble in Morgantown! Pick up your personalized copy of Shining Scars! Or donate to a child staying at WVU Children's Hospital as part of my STARS 4 SCARS program. Thank you! 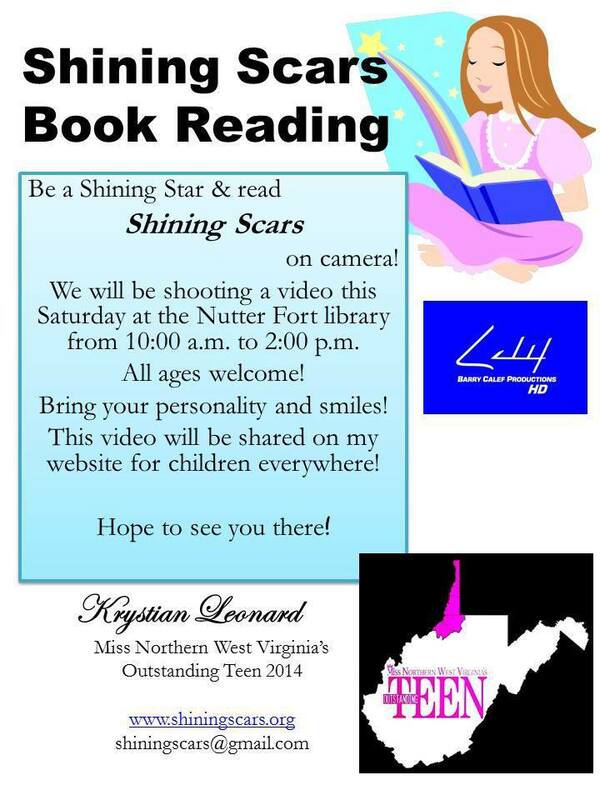 Come by and meet me and pick up a copy of my children's book Shining Scars! I will be in the Mountainlair as part of WV Family FUN Day!! Shining Scars will be available for purchase at this years Jackson's Mill Jubilee. I will be making a special appearance on Saturday August 31, from 10:00 a.m. to 4:00 p.m. to sign any books that you would like personalized! I have loved growing up with the Jubilee and have wonderful memories, it is so exciting to now have a small part in all of the weekend festivities. Following the Miss Southern and Miss Southern WVOT Pageant will be the send off party for our Miss West Virginia 2013 Miranda Harrison! I am honored to be a part of this years Hogs for Heroes held at our local Veteran's Hospital, I will be sharing Shining S.C.A.R.S. and the Miss West Virginia Scholarship Organization. July 1 - 3rd at the Morgantown Event Center, Morgantown West Virginia. I will be competing as Miss Southern West Virginia's Outstanding Teen. One of 28 amazing teens all with one goal, to represent our state at the national competition of Miss America's Outstanding Teen 2013. Come out and purchase your copy of Shining Scars. Hardback books will be available for $16.95 each. I will be at the Best Western Plus Inn, located in Bridgeport WV from 5:30 - 7:30. See you there! I will be signing my children's book at the BookExpo America in NYC on Friday May 31st. Look for me at Booth 2368 where I will be signing from 10:30 - 11:30 a.m. as well as the Author Autographing Area Table 6, from 3:00-4:00 p.m.